Last week I commented a research about Rhizo14 in this blog in three posts. I have followed research about MOOCs all the time (since the year 2009), so it was something I would normally do. I didn’t know how other people had commented this one and I was very astonished about what I have seen. It is The Thing I learned last week. 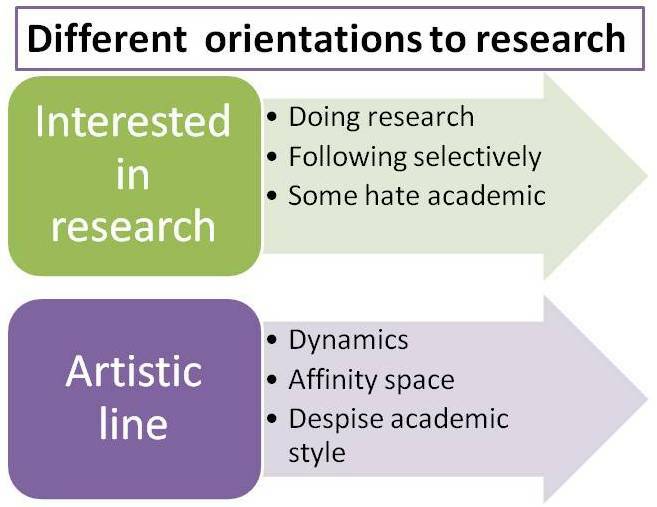 There are different orientations toward research. First some facts about my background and orientation. I have been interested in action research since the 1970’s when I acted as a researcher for the first time. The idea of participatory action research, where the doers are the subjects, not objects, it has been close to my heart for forty years. Another dream was to do practically oriented research and avoid narrow academic traditions. I still remember when a famous professor Martti Takala smiled at me and my colleague and said that he agreed with our motto more than the research itself. Now I can comprehend his feelings. Since then I have learned how challenging it is to act as a ‘practitioner researcher’ and I understand that it is necessary to focus every research, to find the question which can be answered. I have done action research and every time got negative feedback. If you follow development in an institution, they want to hear that they are excellent, not anything else. This is my background shortly and too simply, but I’ll handle the basic concepts in another blog post next week. Now I’ll concentrate on my learning last week. 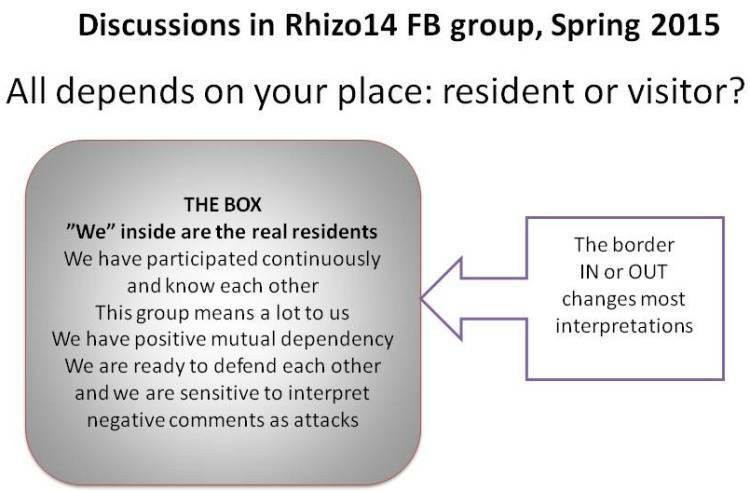 another about a blog post of a Rhizo14 participant which had not an account in FB. So they spoke intentionally behind her back. They named her an attacker and I don’t know why. It was a normal or good post for me. There was much “we-speech” and that orientation excluded the others. I used the concepts Resident and Visitor here instead of Insider and Outsider. David White developed those concepts for participation in the internet in online studies. I think they are the appropriate concepts here. I feel myself a visitor even if I have written there sometimes, I have had long breaks as well. After drawing that image I noticed that it is like the old social psychological description of groupthinking. The residents belong to the group and this frame influences all their interpretations. For instance the line around the box, the border, changes what is bullying and what is not. Those inside are free to name others but they are very sensitive about “others'” sayings. The discussions in the two threads consisted of different parts. Many people behaved well and then it turned to low level again. This is ridiculous, said Simon Ensor many times and I agreed in my mind. Simon said earlier that he participates in Rhizo14 in an affinity space. Perhaps I should understand what it means. The rhizo14 course supported creativity and the use of artistic ways to describe one’s experiences. I appreciated that and enjoyed as long as I could follow without being a native in English. Poetry was difficult to follow but the videos easy. This all helped me to realise that some participants accepted only artistic ways. Every presentation should be dynamic and include whole and complex life in it. So this way may lead to a point where research is not possible or not acceptable. I wonder whether it is possible at all to conceive a research for these people? There are other ways. For instance participants’ experiences may be collected on a platform Padlet where videos can be included as such. Here is an example of the last Padlet of EDCMOOC. I could recognise huge differences in attitudes toward research in the rhizo14 group. Many rhizo14 participants are doing research and want to learn about doing it better while some people deny its value totally. There seems to be a gap between these lines. Building a bridge between these is perhaps too challenging. Anyway it should be understood what research is and why it is necessary to focus on appropriate questions which can be handled. In both groups of the image (interested in research and artistic line) I have recognised negative attitudes toward so called academics or even universities. Sometimes those who make fun of universities know what they are saying and sometimes their criticism comes across as children’s crying or mere envy. I have an intention to handle this issue, I mean research of online learning, during this Spring many times. This is my farewell to the Rhizo14. This entry was posted in change, me, online learning and tagged research. Bookmark the permalink. This post have been hidden and its comment space was closed, because I received a huge amount of spam after publishing this post for the first time: spams with perfect English and very polite but not from real people, one every half hour, nights and days. Akismet had to work hard in order to stop it. It was my first experience of real spamming and I don’t know why. Back to your post – as an author of the paper you mention, and someone who participated in the FB group discussion of it, it was very interesting to read your interpretation of it. But of course, while your interpretation can add to a critique of our paper, a question is – will it? I value it, and your ideas will feed into mine and Jenny’s ideas for future work. But what of the things you speak of ? – the Facebook group discussion? I would be really interested to see if your insights can impinge on those who participated in the discussion on our paper. I certainly tried and failed to engage on Facebook – quite sad!. I am hopeful that your insights might provoke a productive discussion. They were insightful for me. Hi Frances and thanks for bringing life to this blog again. I described here my observations about the feedback you got in the Rhizo14 group. I had to study it because I couldn’t believe my eyes first. Now I have a feeling that I understand how they see the group. They are like a family, they have basic emotional connections to each other and they defend each other against the bad world. Some of your results are interpreted as personal insults and this trauma cannot be handled cognitively. So I am not willing to send anything to them. They may live happy and make the following course as they like. Perhaps they build a beautiful ideology about connection based on mutual love? One tweet I noticed after blogging was T.elliot’s “I keen, therefore I am” and I was linked to it, so I should understand the message. Keen is a verb too? Thanks Heli – ‘keen’ is a very beautiful verb. I am sure it has several meanings but I associate it with wailing when mourning – you can hear it in different cultures (maybe not so much Northern European like Finnish and English). Your four posts have been an absolute gift – it’s such an honour to get such thoughtful engagement with our ideas and our ongoing work will really benefit. I have promised to respond to some of the negative criticisms that actually engaged with the paper but have had other things going on in my life so have put that on a back burner for now. Some of the comments made are best ignored I think. We are trying to get on with completing and publishing the second and third papers. We have a duty, I think, to honour the responses to our survey with the best work we can do to reveal partial and provisional knowledge about the variety of experiences at rhizo 14 not just for those who responded and participated but also for others who may wish to do related work in the future. Here is the story I promised https://francesbell.wordpress.com/2015/04/04/four-women-on-a-train-one-of-many-possible-stories/ – hope you enjoy it despite the rude word. Heli – I am adding my thanks to Frances’. Like her, I value your opinion, which I know comes from many years of experience. As Frances says, we continue to be fascinated by the data we received from our research surveys and interviews and can see many more avenues for future papers, presentations and sharing in other ways, besides the two papers we are currently focussing on. Many thanks for openly sharing your perspective. How to do a meaningful research about open online learning, it is my theme today and during the next months. Let’s see if I learn something. Bookmarking this to come back to it later, Heli. Thank you for your balanced and compassionate way of interacting online. I learn from you and it helps me cope with unwanted behaviour online. Hi Heli. Thanks for writing this. I think it is important to view interactions written or spoken or unspoken (etc) from different perspectives. This blog post offers yet another perspective on what has become an intriguing episode. I don’t think boundaries are so clear (ever). I had a very short exchange with Maha the other day. There was only one written sentence. From inference she misinterpreted completely what i had meant. There are so many opportunities for misunderstanding. As you say when we are not native speakers or when we come from different generations, or countries, the potential for tension, and feelings of exclusion are multiplied. I remember this feeling in twitter chats where the volume of tweets just made me give up. To witness my duty, not to show my wit. Till then, not show my head where thou mayst prove me. So? Misunderstanding or deep mutual understanding? You are an very interesting guy in my eyes.